Brandon Lane is serving with the US military and stationed on duty in Texas. He becomes suspicious at the fact they are being trained to deal with domestic operations and at seeing foreign soldiers from the UN conferring with his commanding officer. Satellites then fire a series of EMP attacks that cut all power and kill all electronic instruments across the US. With suspicious swiftness, the UN establishes martial law and take control of the government. Brandon’s commanding officer orders them to deploy to disarm the civilian populace of their guns. Brandon rebels against these orders only for the UN troops to turn and shoot the rest of his unit. Fleeing with a tape that contains evidence that this was all engineered by enemy foreign powers, Brandon takes refuge with his ex Penny on her family’s ranch as the invading troops come after him, determined to stop the tape from getting out. Mike Norris is the son of Chuck Norris. Mike has maintained a small acting career in sporadic bit parts since the 1980s. (He can be seen on screen here in a supporting part as an old timer living in a cabin who aids Spencer Neville during his journey). Mike made his debut as a director with the crime film The Rage Within (2001), followed by episodes of his father’s tv series Walker, Texas Ranger (1993-2001). Mike’s career took off after that as a director and writer of films for Christian audiences with the likes of Birdie & Bogey (2004), Maggie’s Passage (2009), I Am Gabriel (2012), Mission Air (2014) and The Crossroads of Hunter Wilde (2017), as well as a scripting a further Christian film Bells of Innocence (2003) that starred his father. 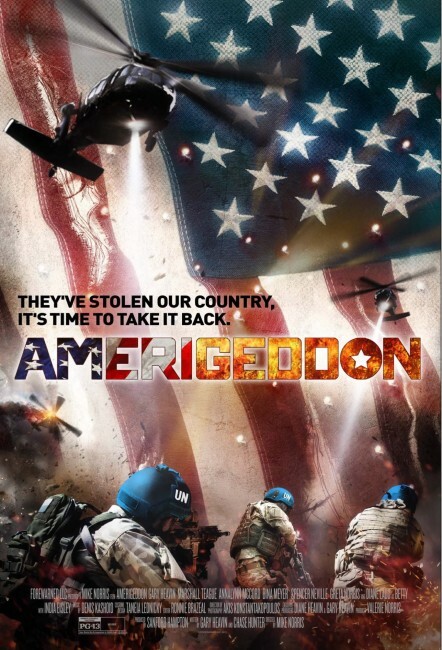 Amerigeddon is not so much another Christian film as it is a film that buys into all the rampant conspiracy theories that much of conservative America and fundamentalist Christianity accepts as truth. There’s Alex Jones, the radio host and vlogger who has become America’s leading conspiracy theorist (including, among other things, promulgating theories about school shootings being fake flag operations, that Obama wanted to confiscate guns and being an anti-vaxxer). Jones’s name is prominently displayed on the credits and he appears in a small cameo as a senator in the opening scenes. The film ticks off all the boxes associated with lunatic conspiracy theories – soldiers are deployed domestically where the first thing they are ordered to do is confiscate the populace’s guns; the United Nations is seen as a sinister agency that has orchestrated the coup of the US government on behalf of foreign powers (which are strongly suggested as being Russian and Chinese); terms are bandied about like ‘Crisis Actor'(the belief there exists a body of actors who are hired to play the roles of the grieving at false flag shooting incidents); the One World Government (the agency that Christianity conspiracy theorists believe the Anti-Christ is trying to establish); and the Texas Secession. People even start to get into the GMO food debate. Elsewhere, Diane Ladd’s grandmother is said to want to create her own militia, while her fifteen year-old granddaughter is a crack gunshot (as all the rest of the family apparently also are). The film opens on a montage of news clips, including ones of Obama and Joe Biden that have even been altered to suggest that they want to curtail civil liberties. It should be noted that what we have here is exactly the fantasies that play out through the heads of people like Cliven Bundy, the audience for Fox News and those who unquestioningly support Alex Jones and Donald Trump – that a liberal government that has bent far too much to the dictates of the UN is wanting to take away the ordinary man’s guns and override the Second Amendment. Amerigeddon is essentially a variant on the Right Wing invasion fantasy of yore – that The Enemy is about to invade the USA and depose government, liberty and family values and especially confiscate the average man’s guns. We have had variants on this in the Soviet invasion films from the heyday of the Cold War such as Invasion USA (1952) to 80s revivals such as Red Dawn (1984) and Chuck Norris’s own Invasion U.S.A. (1985). Indeed, Mike Norris seems to have construed Amerigeddon as a conscious take on his father’s Invasion U.S.A., although this never gets much beyond its characters acting as mouthpieces to actually let its action element kick in. It may be an understatement to say that it is not exactly a credible film – it has the weird belief that an entire heavily-armed invasion force can be held back by half-a-dozen people on a farm and their guns with a single tape recording as evidence. There are less characters in the film than there are actors that have been written as mouthpieces for viewpoints. India Eisley pouts to her father (Carey Scott): “Dad, why do you waste your time with that fascist conspiracy nut?” Said fascist conspiracy nut later calls Carey Scott with greeting: “How’s my favourite liberal senator?” Do people actually talk like that in the real world, you keep wondering. (The only thing that Norris never digs a knife in about is the fact that Eisley also leads a campus women’s rights crusade). The film comes with heavily symbolic shots of the enemy soldiers shooting up a tent filled with military, represented by bullet holes going through an American flag, or of enemy boots crumbling a flyer distributed by India Eisley saying ‘Girl Know Your Rights’.